One thing if you’re having a Harry Potter party? Start collecting. Old books – particularly hard cover – see if you can snag any from a second hand shop. Old boxes – any size – because it’s much easier to draw and glue over a premade box then to create hundreds yourself… and the scrap cardboard will come in handy, trust me. Old frames – or new – particularly wooden, or vintage-looking. You can pick up hundreds of cheap designs from Crazy Clark’s and reject shops for $1-$10. And we musn’t forget old bottles and jars for potions… or, something a bit more unusual. You are looking at Kate’s Jar Lantern. Many people save up their old jars for decorations around the yard, hanging jars in trees and lighting them with candles. Some have designs printed on them, some don’t. Either way, they can look pretty effective. But I had a slightly different idea in mind, using the exact same methods as these guys. Do you think wizards go around using torches? No. They use lanterns, as seen on Harry’s first encounter in the Forbidden Forest. A taper or long handled lighter. These are really simple and can take five minutes to do. Basically clean your jars if you’re using old food jars. I’ve used an old jam jar. Make sure they have a nice lip around the top that the wire will be able to sit nicely beneath. 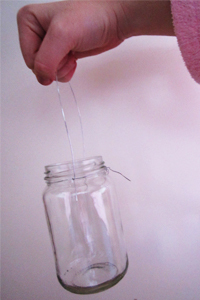 Measure and cut a piece of wire just longer than the circumference of the mouth of the jar. Cut a second piece about 11-13 inches and bend into a u-shape for the handle. Twist each end around opposite sides of your wire-circumference. Wrap tightly around the mouth of the jar and twist the ends together. You’ll probably want to use a thicker wire than I’ve used below, in which case you’ll be best off with the pliers. But check out the link to the tutorial for more in-depth instructions with photos! You can half fill the jar up with either sand or dirt if you like, which surprisingly looks really effective and gives the candle a position to sit. 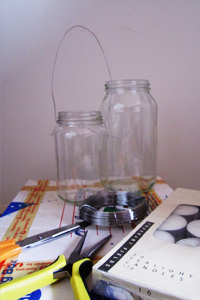 Mine clearly are not finished – mainly due to my party being months (or years) away, and while I can store jars, I don’t want to start storing upright handles, for such a simple project that can be finished much closer to the day. And besides, this blog is a way for me to track all of my ideas and tutorials I’ve found, so I can easily find them later! So what do you do with these lanterns for a Harry Potter party? Once again, I’m still deciding. 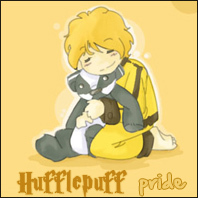 But, if you check out Harry Potter parties around on the net, you’ll often find people having made scavenger hunts in the “Forbidden Forest” in their backyard. Who doesn’t love a scavenger hunt? The main problem I have with this is the Forbidden Forest is supposed to be dark and scary. I figure the easiest way to do this, is to have it at night time – hence, you can give your guests lanterns to hunt around with! I’m guessing one lantern between two people, then they can go out in pairs and start hunting. At the moment it’s just for a scavenger hunt, but this could be changed to anything you can think of for your party! I think this makes it much more exciting (and difficult!) for your guests, but should only be aimed at older guests (15+) who are going to be sensible (by that I mean, yes they can run around and be absolutely crazy, but can also be safe in the dark with glass jars and candles… perfect for that 21st party ;)). Otherwise, they’re just good as outside decorations as the tutorials show. ~ by acciomagic on September 28, 2011.